Yup, he got a bigger gun. Take Ocean’s 11, replace the crew with a wizard, a warlock, two fallen angel-possesed bad guys, a cop, a knight of the cross, and a summoner, then throw in a pinch of Mab, the queen of the winter fae and Uriel the archangel, and you’ve got Skin Game, by Jim Butcher. Yeah, I know, it’s a mouthful, but if you say it out loud, it sounds really impressive! My friend Matt claims that this is the best book in the series. For those of you that aren’t familiar, the Dresden Files is Jim Butcher’s rather awesome (now 15 book) series about a wizard-detective that lives in Chicago. Yes, I said “wizard-detective,” and no, the series doesn’t drag despite its prodigious length. Skin Game is the newest book in the series, and it only came out a few weeks ago. I was in the middle of Words of Radiance by Brandon Sanderson (which I’ll likely review soon), and it took a lot of self control to keep myself from attempting to read both books at the same time. After the break you’ll find my review (with some light spoilers) and one very new, very cool feature: an embedded sample of the book! Seriously, click it. It works like YouTube, but with a book (although you do have to turn the pages yourself) which makes it much, much cooler than any streaming video. Everyone knows the book is always better than the movie. First off, I think there’s a new-ish sub-genre cropping up that’s based on heists. For now, I’ll call them “heist stories.” Imaginative, huh? There’s already “Caper stories, but I’m not sure they’re really one-in-the-same. “Heist stories” are a little different because they’re basically derived from the Ocean’s Eleven model. I suppose Ocean’s Eleven was a twist on caper stories, so maybe heist stories are a sub-sub-genre? Congrats on your new sub-sub genre, guys! OK, enough of that. This book is about a heist in which Harry and company set out to perform a little bit of burgling. Needless to say, the burglary is extremely dangerous all on its own, and to cap it all of, Nicodemus Archleone is the gang-leader of this particular nefarious quest. He’s one of Harry’s worst enemies. They get along great. So, you’ve got a team of “misfits” that are so miss fit that they’d be killing each other in any other circumstance. Seriously, one of the guys (Binder), is there despite the fact that Harry promised to kill him if he ever showed his face in Chicago again. The situation is a bit tense (to say the least) all the way through. Butcher pulls this off pretty well throughout, and I had NO idea how he was going to get out of the inevitable double-cross at the end until the time actually arrived. OK, so was it good? Well, yeah, of course it was. Jim Butcher is an amazing writer. Even if you don’t dig his setting and/or genre, you’ve got to hand it to the man because he’s got writing chops. As per usual, the pacing and prose of this novel were pretty excellent with only one possible exception that I’ll include in a spoiler box for you. [su_spoiler title=”Spoiler: There’s this one chapter . . .” style=”fancy” icon=”chevron-circle” anchor=”Heist_Chapter”]In typical heist fashion, the action at the end is interrupted for a grand reveal. Think of Ocean’s Eleven. Near the end of the movie, there’s a scene that takes us back in time to show us our genius thieves doing some extra-secret planning that we didn’t know about. This reveal comes along just when things are looking awfully bleak for our heroes to show us that they do, in fact, have one more trick of their collective sleeve. Skin Game has that chapter right at the end. Harry is looking quite badly screwed, surrounded by some of the baddest baddies he’s ever messed with. He’s also got no apparent backup, and is more or less out of the energy he needs to cast spells. Then we jump to a flashback scene, and find out that he hired one of Nick’s crew before the Denarian had a chance. That makes this mole loyal to Harry, and it’s actually a good twist. One of the most common criticisms I’ve seen regarding Skin Game is that this book is somehow “light,” or there isn’t as much on the line as in recent novels. People found it to be lacking in world-ending tension. I disagree with this completely, and would postulate that the danger in this book is just a bit more subtle than in the others. If you stop to think about who Harry is working for in this one (and I mean who he’s really working for), what is stolen, who got what, and all of the major character moments, you’ll find that Skin Game is anything but light. [su_spoiler title=”Spoiler: What’s stolen?” style=”fancy” icon=”chevron-circle” anchor=”Stolen_stuff”] Harry gets everything but the Grail, but Nic with “just” the Holy Grail is still plenty frightening! Murphy breaks Fidelacchius, the Sword of Faith, realizing she’s definitely not meant to be a Knight (right now). Harry comes more to terms with the events from Changes. Michael helps him realize that he is and was a good man. Harry resolves to be a proper father, though he isn’t sure how it’s going to work yet. Nic kills his own daughter, Diedre to gain access to Hades’s vault. Molly is up to some stuff she doesn’t want to share with Harry, and can somehow talk on a cell phone like a normal, vanilla mortal (this one is subtle, but possibly major). Harry becomes, not only the keeper of the Swords, but also the keeper of three of the most powerful artifacts from the Christian faith. Harry’s daughter, Maggie, really meets her dad. Butters, the man who keeps polka alive, becomes an honest-to-God Knight of the Cross Jedi (with a lightsaber version of Fidelacchius–it’s as awesome as it sounds). Murph and Harry seem to finally make the call to be in a relationship! Marcone gains more power, and Harry spits in his face a bit (surprise). Michael takes on Uriel’s grace and becomes a super-powered Knight to back Harry up on his heist. So the whole “this is a light Dresden Files novel” thing doesn’t fly with me. The danger here is a little less in-your-face than some of the other novels, but the setup that Butcher crafted is massive. The book is very, very good. I don’t think it’s the best in the series (personally, I like Turn Coat and Dead Beat), but it’s definitely up there. You can absolutely infer that something even bigger than Changes is on the way, and Harry is at the center of it. My advice? If you’re a fan of the series, it’s still just as good as you remember. If you haven’t read the Dresden Files, you’re really missing out. They’re great books, and the series is one of my all-time favorites. Go get Storm Front now if that’s you. 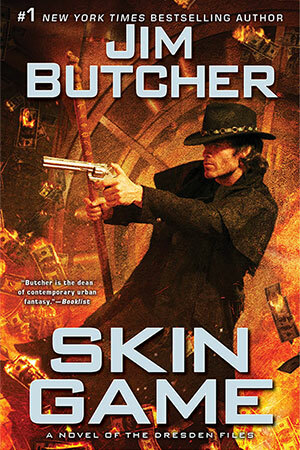 Without further ado, I give you a FREE sample of Skin Game by Jim Butcher. Enjoy! I agree with you completely on one point: Harry progressed a ton as a character in this novel. I’ll even go so far as to say that these steps reaffirmed my love for Dresden because of his renewed connections. Harry was just more . . . Harry-like in this one; especially toward the end. For me, though, it wasn’t quite enough to make this the best book in the series. It’s close! But it’s hard to beat Harry riding a T-Rex into battle, or Morgan just showing up at his door out of the blue to be saved. I’ll give you this: this book probably had the deepest character development in the series, and is definitely (in my view) the biggest setup we’ve seen for whatever is coming. Major players were placed on the board, and some allegiances became more clear. All of that is a big deal!